The film’s leitmotif: Twenty seconds of fine metallic ritual percussion set as prelude. The hypnotic sound returns again and again. In between: silence. The Brehm’sche x-ray view shapes this film, too: the negative image of an androgynous face, moving in slow motion, forms the visual opening—white eye sockets, black pupils. A performance takes place, an athletic act, silent but wildly dynamic: a body shoots through the picture, the intensity of the course of events is emphasized even more by the deceleration. Tokyo is a journey into the empire of black and white and five-hundred shades of grey. The eyes of an Asian woman radiate a blinding white against one’s one. 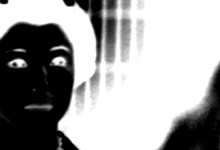 Other faces surface, other bodies, all with black skin and white shadows. A world on the other side of the mirror opens up in spooky calm. Tokyo is a body and face film, and thereby entirely immaterial: living masks stare at one another, the undead eyes nearly emotionless. Almost imperceptibly, the electronic image surges, drives an inexplicable inner pulse across the surface of the film: everything flickers, pulsates, blurs, as side effect of being filmed and the enlargement of details. Interacting bodies reflected in one another loll before a languorously held camera. Black smoke spews from a man’s mouth, longing, tentative movements are enacted; gestures, whose sense and aim cannot always be ascertained. The threat (and use) of violence evokes silent cries. The masked figures’ impenetrable gaze remains. The ecstasy does not change anything. The beauty is based on the uniformity. Trance as trance can. Faces and body parts inverted to the negative, zoomed in on, with their motion slowed, so that they are transformed into slowly moving surfaces in shades of gray; facial expressions are intensified by lingering, contours blend into the indefinite surroundings, the precise rhythm is highlighted by echoing sound. Evidence of the film’s fragile dramatic character are two consecutive shots of eyes – the man’s eyes do not blink, do not question, do not look away. The woman also gazes steadily and firmly, but within a few seconds, her eyes close.